When I was looking up interesting things to eat in Las Vegas, most places tended to be celebrity chef restaurants (of which we have plenty of access to in Singapore) or more casual chains from around the country. But that's the thing: they tended to be from elsewhere rather than local. Sure, there were a few old school diners or steak and seafood places, but I struggled to find something that really grabbed me. Then it dawned on me: what was the dish that I would usually get in Vegas when I was younger? Prime rib. Cheap prime rib from a late night place, perhaps even in a casino. 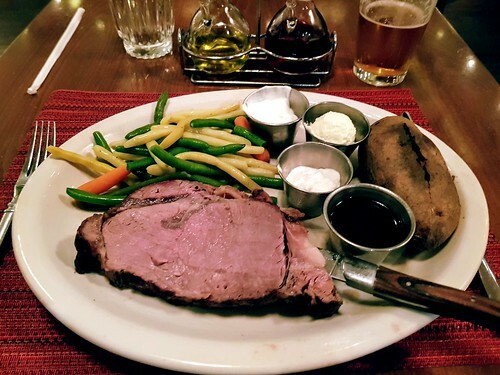 Sure, prime rib is available across the country, and in fact there's a Lawry's in Vegas too. But I wanted a cheap one. And after a quick search, I'd found my destination: Siegel's, a 24 hour place at the El Cortez Hotel in downtown Las Vegas (600 East Fremont Street, 702-385-5200). Their menu shows a 12oz (340g) cut for $22 or a 16oz (450g) for $28. But I was here for the $10.95 special. It was only 8oz (225g), but it came with a potato and veggies, with an option for a $3 side salad, and it turned out to be just right for me. Sure, the meat was a bit lean and dry, but a dunk in the au jus and horseradish sauce fixed that right up. I was happy; cheap prime rib has always been a guilty pleasure of mine.